It has been a while since I shopped at Morrisons. For no particular reason other than proximity, or a lack thereof. So when BritMums and Morrisons offered me the opportunity, I was rather excited and looking forward to visiting what used to be my regular supermarket a while ago. Being predominantly vegetarian (we don't eat meat every day, only when we feel like it), the bulk of my weekly shopping is made up of fresh fruit and vegetables. So that's where I headed to first. I was immediately struck by how fresh all the produce looked. The vibrant colours were quite appetising too. An obvious bonus given that M and I are trying to eat more home-cooked, healthier meals. 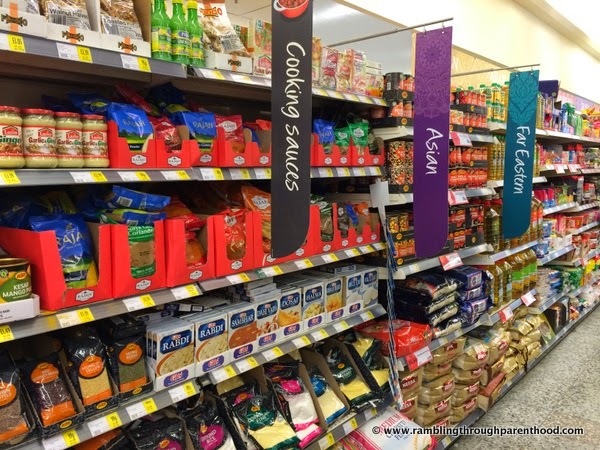 There was a good range available and I was able to pick up quite a few things for my salads and my curries. Some things were cheaper than at other supermarkets, others about the same. All the shelves were well-stocked. 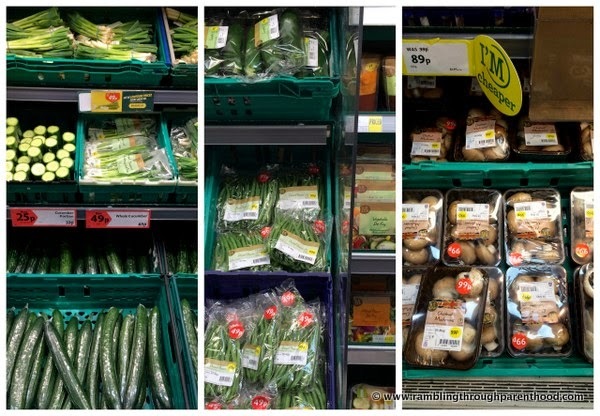 One thing that caught my attention were the bright yellow signs pointing to products that were cheaper than at other supermarkets. Another thing was the separate display of living herbs. I do tend to use a lot of fresh herbs and spice in my cooking, so this was just perfect. Not one to routinely eat salad, I could not help but admire the lovely salad bar. Both M and I found it very appetising and very nearly ditched our bank holiday meal plan in favour of an extra large tub of salad. The Salad Bar - impressed! Another excellent addition was the Asian food section. It was very well stocked with all the spices, rice, masalas and other edibles I normally buy from an Asian grocery store. There were some things there that I have never seen on a supermarket shelf before. I would have to visit a specialist grocery to get those. It was wonderful to find everything under one roof at Morrisons. I spent all my vouchers and a couple of extra quid on what was a fairly routine weekly grocery shop. I love making shopping lists, and more or less stuck to what was on mine. Except for the tub of ice-cream perhaps. Armed with all my shopping, I set about rustling up a bank holiday meal from heaven. I made some spicy lamb burgers with coriander. Here is how I made them. Add all the ingredients to the minced lamb and mix together to form a uniform mixture. Divide the spiced lamb mince into equal portions. Roll and pat each portion in the palms of your hands to make the patties for your burgers. 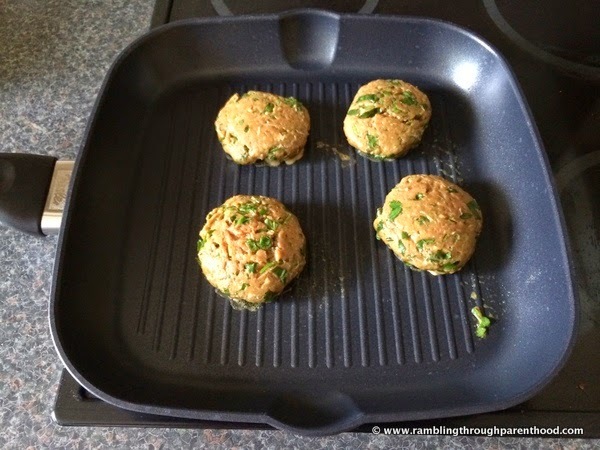 Cook the patties in a grill pan (or a barbecue) first on one side and then the other till all the meat is thoroughly cooked and the surfaces are browned. Serve with a roll of bread and a garden salad. Slices of cheese and tomato ketchup are optional extras. 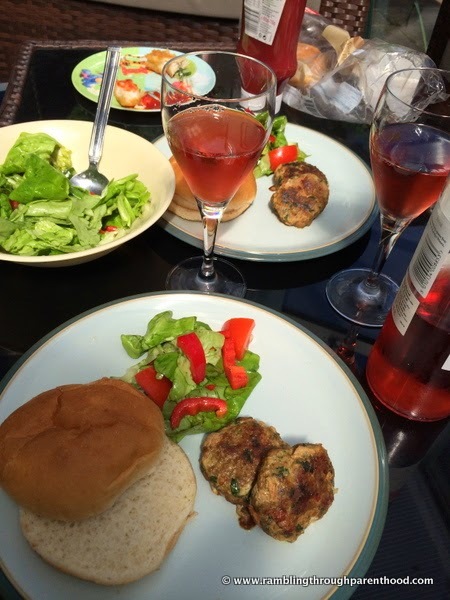 These burgers are best enjoyed with a glass of chilled rose wine in the company of friends and family on a warm sunny afternoon. The one thing I was apprehensive about was that the meat was not organic. I checked in-store on the shelves and at the butcher's counter, and was told Morrison's do not stock organic meat. But I need not have worried at all. The meat was of good quality and made some rather scrumptious burgers. The pre-sliced buns were a lovely touch. They saved me the hassle of cleaning up bread crumbs, at no extra cost at all. 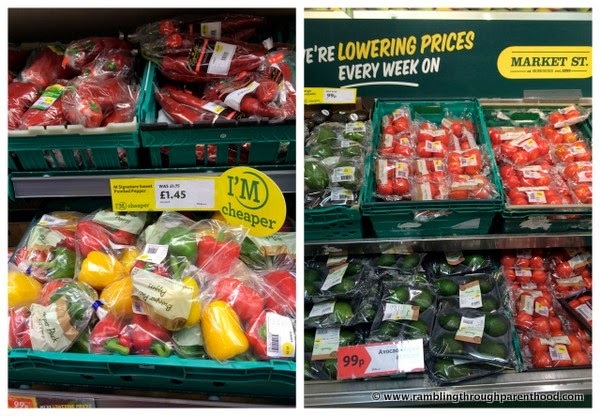 Very thoughtful, Morrisons! 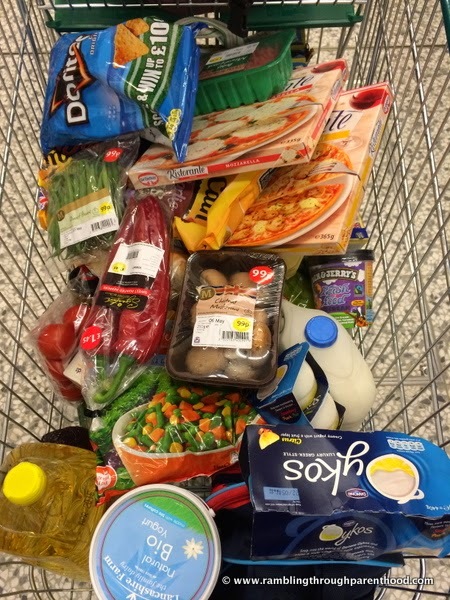 Budget-wise, I think I spent what I would have at any other supermarket for the things I bought. Quality-wise, I was more than impressed. The fruit and veg were fresh, the meat was good. The taste was excellent all round, as I have been finding out every day this past week. 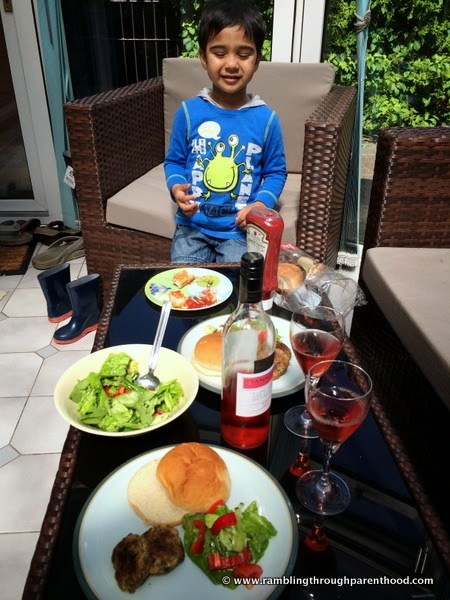 And at less than £2 per person for a delicious home-cooked meal of spicy lamb and coriander burgers with side-salad, I can keep smiling. There are a few things I did not purchase this time. Morrisons Nutmeg range of clothes, for one. Their cake shop, for another. Good reasons to go back for another shop, surely! And thank you, Morrisons and Britmums for making this bank holiday extra special. Disclaimer: I was given £80 worth of vouchers by Britmums and Morrisons to shop at their store and write a post about my experience. All opinions expressed are entirely my own and completely honest. i very rarely eat meat, and the one meat i just really don't like is lamb! these do look tasty though, especially with a bit of spice. and that salad bar is impressive indeed! I don't eat meat but the rest of the family do and they all say that meat from Morrisons is excellent. I think their bread's very good too. Mmmm, these look mouthwateringly good. Great photos - and I like the sound of those lamb burgers! Wish we had a half decent Morrisons near us. 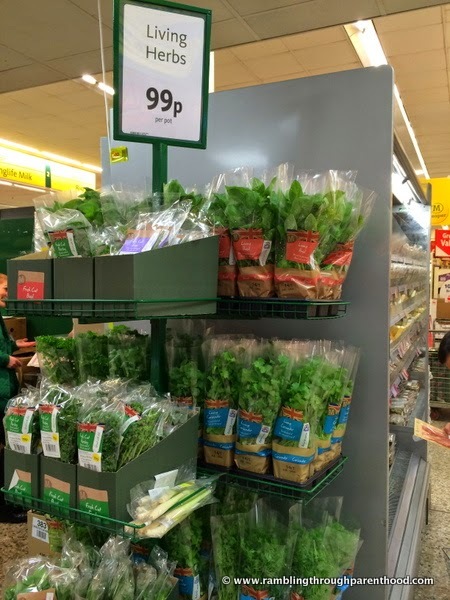 That salad bar looks amazing - and 99p for living herbs, that's brilliant! Those look SO good! I love lamp chops but I have never tried lamb burgers... I think I'll get the mister to make some! Your Morrison's looks fab. We only have a small one on our local high street but I can usualyl get everything I need. So glad you got all those lovely ingredients to make such lovely recipe. I like the addition of fresh herbs in it; it also makes them look so much more interesting ;-) and yummmy! Mmmm these look lush, and not to tricky even for muppets like me in the kitchen! 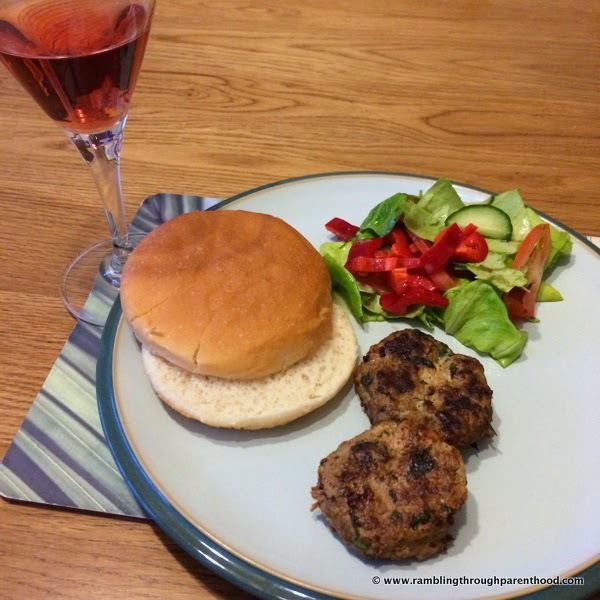 They look delicious- we bought the lamb burgers from the signature range, which were fantastic- definitely will be making from scratch now! 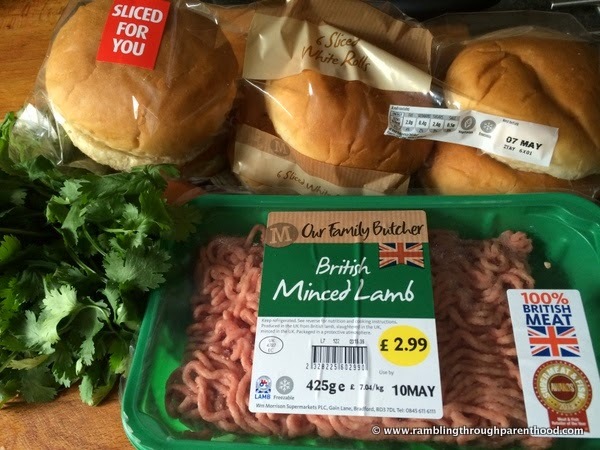 We treated ourselves to the lamb burgers from the signature range- I'd definitely love to make them from scratch in the future- yours looks delicious and probably a lot better value for money! Morrisons is just a stones throw away from my home, so it has predominantly been my regular shop. They do stock fresh fruits and veggies, but usually by evening (after work) they deplete. I tend to find their mince quite fattening, I wish they had lean meat mince. Salad bar is my regular takeaway...but again not in the evenings. I just love their Nutmeg clothes. All my baby's clothes are from here. They are of good quality and colourful choice with half the price that you get at Mothercare or Mamas n Papas. If you are visiting the fresh bakery section, try out their carrot cake and the fresh cream collections. My son loves swiss roll. I don't remember seeing a salad bar at our Morrisons...may have to go double check as it sure looks good! Those burgers look yum!! The burgers look divine!!! OMG @ the salad cart at your Morrisons!! I want one of them at ours! I'm not a massive meat fan, but I do like a good burger! I like how much extra you've added to the mix too! I made beef burgers with minced beef from Morrisons for dinner last night and it was really good quality. 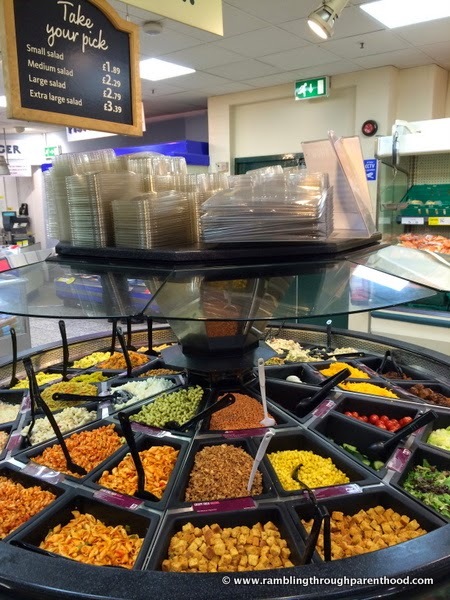 I love the salad bar at Morrisons and used to go just to get salad and doughnuts! Wow they look yummy. 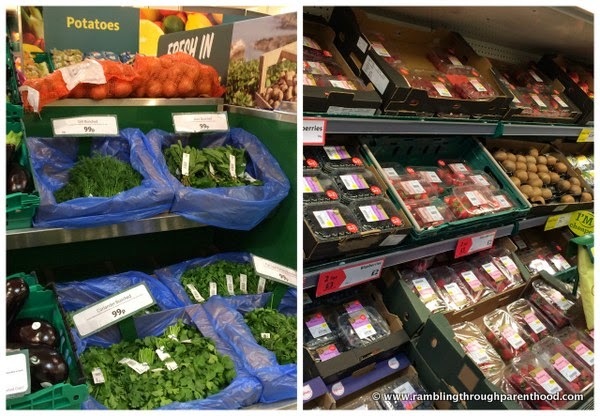 I love the fresh veg area in our new look Morrisons store too!